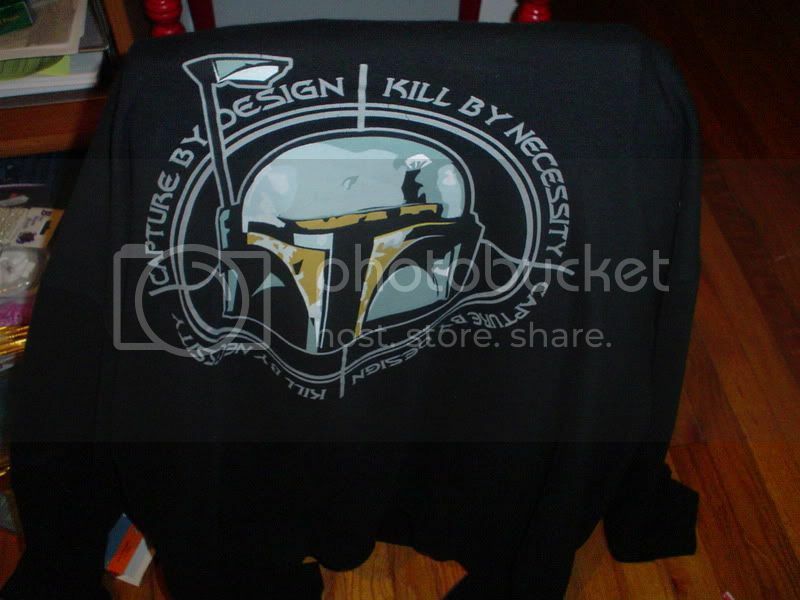 Message Boards - Boba Fett Fan Club → Collecting → Boba Fett sweatshirt ERROR!! Topic: Boba Fett sweatshirt ERROR!! so it came to my attention the other day when i was looking for fabric to match fetts colors and i say to myself, why am i thinking i have him on my back...so i take my sweatshirt off and look at the picture and it clicked in my mind that the colors were off so heres my prblem. yes the colors are off and are supposed to be but the outline to the black visor was yellow ornage...not reddish and it raised an even worse question in my mind...am i wearing a Jodo Kast sweatshirt instead of a Boba Fett? anyone else notice this because i know a few other people on the board have this sweatshirt. Re: Boba Fett sweatshirt ERROR!! Either it is Jodo or it's really washed out. It looks like Kast to me. i think its Kast because ive only washed it twice and without bleach so its practically the same if not exactly. I am sure that it is not Kast. The color is merely off. Oh yeah look at their helmets. The helmet on the sweatshirt has the dent on it. Kast's helmet does not. Boba's does. That dent is from the reek when it tried to kill Jango. Therefore, that helmet on your sweater has to be Boba. i dno it could be a glare...ok so i see what you mean but it is a close call none the less. That Ain't No Glare!!!!!!!!!!!!!!!!!!!!!!!!!!!!!!!!!!!!!!!!!!!!!!!!!!!!!!!!!!!!! It's Boba Fett!!!!!!!!! 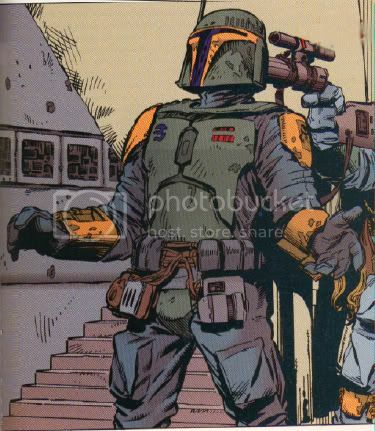 Yeah but look Boba's helmet has the paint scraped off, jodo's doesn't, and the sweaters does have it scraped off. Add it up, its Boba Fett. If the part near the visor came out orange it was a mistake, but it's intended to be Boba. still its a very close similarity but i see what you mean...now i want a "appropriate" colored fett sweatshirt but still gotta love this 1. 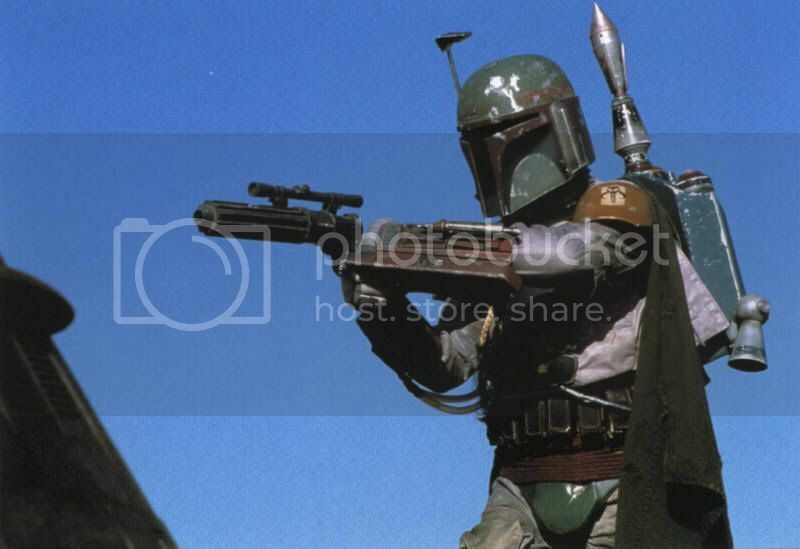 It could very well be Kast....Just think of Fett, and that he has him in his cross hairs getting ready to kill him! I love that sweatshirt! I've been eyeing it on eBay for awhile, and the unanimous consensus of the various vendors selling it new with tags is that it's Boba Fett. Not that they would be Fett experts or anything, but I'm guessing that it says so on the tags. I think it is supposed to be Boba Fett and the manufacturer just got the color wrong, either through carelessness or deliberate choice. Maybe the rust-color was too hard to print or something. yea it is boba on the tags andi got it from hot topic too and its my job to look into it this much, if i don't who will...then we all could be l;iving fett lies and i don't think i can do that. That is not exactly what I ment. They simply would not make a shirt of Jodo Kast, for the same reason that they would not make a shirt of Luuke Skywalker, IG-72, Ailyn Vel, or Plo Koon. Most people do not know who they are. they should though and i wonder if you can on the SWshop custom shirt maker, i haven't looked at it so im not sure. Last I checked, you cannot. Boba is not as popular as you think. Certainly not popular enough to have a one time character from his series put on a shirt. They simply would not make a shirt of Jodo Kast, for the same reason that they would not make a shirt of Luuke Skywalker, IG-72, Ailyn Vel, or Plo Koon. Most people do not know who they are. First time i looked I thought u were saying Luke skywalker isn't well known, then I saw the second U. But you're right about that, most people don't know who those people are. Unfortunately in all honesty most people don't know who Boba Fett is. We are watching ANH in film analysis at the moment, and since we are watching the "extra super duper secret remastered edition" with Boba and Jabba meeting with Han in Mos Eisley. My teacher pointed out that it was an added scene, and 90% of our class didn't know who Boba was when he mentioned his name. I think it's purposefully washed-out because everything from Hot Topic is supposed to look all artsy and punkish and old-school.... As if it's been through the laundry way too many times because you bought it vintage. Or something like that. That's a really good point! I was just in Hot Topic last weekend and that's a good description of a lot of their shirts and sweatshirts. Maybe it's "supposed" to be all faded. Yes, Luuke Skywalker was in the Thrawn Trilogy, in the third book Last Command.